It had never crossed my mind to try to write a Regency sheikh until I was asked to contribute to Mills&Boon’s Summer Sheikhs anthology. I confess, I was a bit daunted at first, since the Arabian world of the early ninteenth century was (if you’ll pardon the pun) very much virgin territory. As for tents, my experience was confined to nights spent under canvas accompanied by those twin stalwarts of the Scottish summer, rain and midges (aka Scottish mosquitoes) – not the most romantic of backdrops, however breathtaking the scenery. Luckily, my editor pointed my in the direction of Lady Hester Stanhope and I was instantly captivated by the exotic, intoxicating and above all utterly ‘other’ world in which she had travelled. Even today, in the age of sat-navs, cell phones and personal alarms, many women find the prospect of traveling alone to a foreign land daunting, which makes Lady Hester all the more remarkable. Lady Hester Stanhope (1776-1839) was the niece of William Pitt the Younger, and played his politica hostess for many years. When Pitt died, Lady Hester couldn’t settle to the conventional life of a spinster and in 1810, she set off on her travels to the East. Of course, she didn’t literally travel alone. Her faithful maid, her physician, and her lover accompanied her, but there is no doubt that it was Lady Hester who ran the show. And what a show! Lord Byron dived from the pier at Piraeus to meet her boat. During the raging storm which eventually saw her shipwrecked in Rhodes, she calmly served the crew wine in her own crystal glasses. 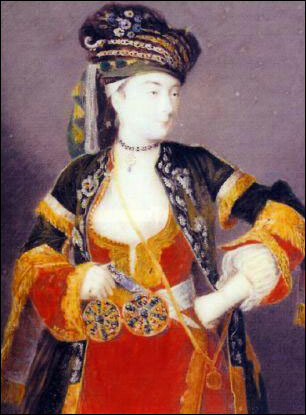 Having lost everything when the ship finally sank, Lady Hester took to wearing male Turkish dress – she refused to wear a veil. Richly embroidered pantaloons, a turban, and a sash in which she stashed her sabre and pistol characterised Lady Hester’s dress to the end of her days. Arriving in Palmyra Bedouin-style with a caravan of twenty-two camels (she never travelled light!) she was crowned Queen of the Desert. The ruthless Pasha of Egypt, Mehmet Ali, treated her as an honorary man (high praise indeed!). In the Lebanon where she spent much of her life, she fearlessly challenged local despots and gave sanctuary to many of their victims. Lady Hester defied convention and description. Autocratic, outspoken, eccentric, fearless, ruthless and compassionate, she was not a woman to inspire indifference. She certainly inspired my Princes of the Desert trilogy. Celia, the heroine of Innocent in the Sheikh’s Harem, shares her background as a diplomatic hostess, and many of her experiences as she travels from Cairo to the desert kingdom of Balyrma (named, of course, for Palmyra). All three of my heroines share Lady Hester’s love of the harsh beauty of the desert, the utter contrast between the heady, sensuous world of sheikhs and harems and the conventional life they have left behind. Their stories are, I hope, compelling, but not any more compelling than the story of Lady Hester Stanhope, a truly remarkable Regency woman. If you’re interested in reading a lot more about Lady Hester, I can highly recommend Lorna Sage’s excellent biography, Lady Hester, Queen of the East.